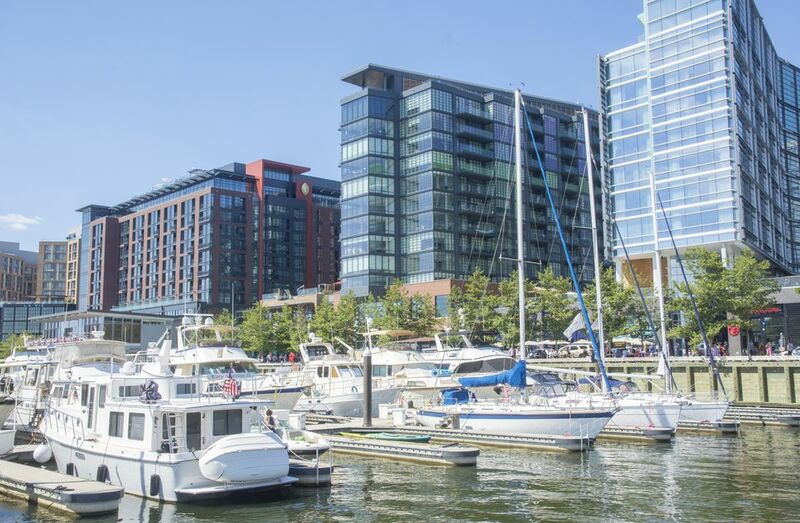 The District Wharf, DC's buzzy new waterfront destination, opened in 2017 with beautiful views of the Potomac River, a world-class concert venue, restaurants for nearly every craving, parks, a marina and more. Here's what to know about this new neighborhood. This ambitious new mixed-use development's phase I opened in October 2017 along Washington, DC's southwest waterfront, with the goal of revitalizing the area with all-new housing, offices, restaurants, entertainment venues, hotels, shops, and more. The project also revitalized the historic Maine Avenue fish market. Phase II of The Wharf will bring an additional 1.15 million square feet of mixed-use development with a slated completion date of 2022. District Wharf is located at 735 Water Street Southwest. Boat owners have it easy when it comes to getting to The Wharf: They can just dock at the marina. But there are plenty of options for everyone else. Drivers can park in an underground garage off Maine Avenue SW with entrances at Blair Alley, Sutton Square and 7th Street Park; note that the garage does fill up during peak weekend times. View prices here. Two metro stations are within walking distance to the neighborhood. The Waterfront Metro station is a five-minute walk, while the L'Enfant Plaza Metro station is a 10-minute walk — and a free neighborhood shuttle serves the L'Enfant Plaza Metro station and the National Mall if you want to rest your legs. The shuttle runs Monday – Thursday, 6:30 a.m. – 11:30 p.m.; Friday, 6:30 a.m. – 1 a.m.; Saturday, 9 a.m. – 1 a.m.; and Sunday, 9 a.m. – 11 p.m. For Metro bus lines that serve The Wharf neighborhood, click here. Even non-boat owners can take a water route to The Wharf. Water taxis venture sail there from National Harbor, Alexandria and Georgetown. A round-trip ticket for adults starts at $18. A Wharf Jitney also runs from The Wharf's Recreation Pier to East Potomac Park. The big draw for music fans here is The Anthem, a new concert venue from the owners of the famed 9:30 Club on U Street. The Anthem can hold up to 6,000 people and draws acts like Florence + The Machine, Miguel, Janelle Monae, Beck and more popular indie acts. That's not the only concert venue in the neighborhood. Pearl Street Warehouse is home to Americana-themed acts, and Union Stage offers a subterranean performance hall. Kirwan's Irish Pub also offers live Irish music. If you prefer something more active, head to the recreation pier and rent a kayak or paddleboard to get out on the Potomac. There are also plenty of open green spaces in The Wharf neighborhood. Kids will particularly love the splash fountains at 7th Street Park. After splashing around, go window shopping at the Politics + Prose bookstore or other nearby shops. If you're not visiting The Wharf for a concert, you're likely here to eat. There are 30 and counting different restaurants, cafes, and eateries. Spend some time strolling around the Fish Market, which bills itself as the country's oldest continuously operating open-air fish market. It received a makeover when The Wharf complex was under construction, but you can still fill up a cooler with seafood to take home or dine on cooked fish dishes like crab cakes. The options when it comes to eating out are seemingly never-ending. Go high-end at D.C. restaurateurs Fabio and Maria Trabocchi's Spanish-themed seafood restaurant Del Mar. Try chef Kwame Onwuachi's Afro-Caribbean cuisine at Kith and Kin or chef Cathal Armstrong's take on Southeast Asian food at Kaliwa. Lupo Marino serves up pizza and Italian street foods, while Mi Vida is a sprawling Mexican restaurant with a view and Hank's Oyster Bar is a D.C. seafood favorite. For quicker service, there's a Shake Shack; or, get a birds-eye view of the gorgeous waterfront view at rooftop bar and lounge Whiskey Charlie. If you're in the mood for something sweet, there's a Milk Bar here and a District Doughnut outpost. Check out all the restaurants at The Wharf here, and feel free to walk around to see if anything catches your eye. The waterfront streets and plazas are a hub of activity, with fun events like workout classes and evening dancing sessions. There's a Wharf ice rink in the winter months, and big events for the Christmas season including the District Holiday Boat Parade and Fireworks in the beginning of December and Christmas Caroling and a Fruit Cake Festival. Another big holiday event is the Mardi Gras Parade. Spring and summer events include the Capital Dragon Boat Regatta, Petalpalooza inspired by the nearby Cherry Blossom Festival, DC JazzFest, and the Southwest Waterfront Fireworks Festival. Download the District Wharf App to be fully informed on activities, dates and times. The Wharf is just one of the constantly-evolving neighborhoods on the Waterfront. From here, you can explore the Capitol Riverfront neighborhood, home to Nationals Park. Take The Wharf boat shuttle to see D.C. recreation spot East Potomac Park and Hains Point. Combine dinner with a show by heading to the lovely Arena Stage theatre right around the corner. Museums aren't far either: The Museum of the Bible, Holocaust Memorial Museum and all the Smithsonian museums of the National Mall are a shuttle ride away. It's an easy jumping off point to explore Washington's famous monuments and memorials as well, including the nearby Thomas Jefferson Memorial. Exploring the Southwest Waterfront of Washington, D.C.